So, I finally decided to swallow my 'fears' and enter a card in one of the Gina K. Designs Stamp TV challenges. I opted to try Jessica Fick's sketch challenge. Jessica even included the dimensions in her directions, so aside from not having square Nesties, the card went fairly quickly! Rupa Shevde's "So Grateful" pumpkin image was what I chose for the center section. It is stamped on white. As usual, my Kooh-I-Noor Colored Pencils were my coloring tool. I then stippled the white space around the pumpkins with Marvy Terra Cotta Ink. Instead of buttons as an embellishment, I chose to use Gina K's "Friendship Blooms" set. I took the tall vase, stamped just the tall mum twice, colored it, cut it out, and adhered the two mums with pop dots. The four square pieces of background DP are from "Sunlit Summer" Downloadable DP, found in the "Freebies" on the Stamp TV site. If you've never been to this site, you need to go! There are several sets, and believe me, these downloadable papers are beautiful! It's been a pretty quiet day at Patti J. 's place! I went into town late this a.m., had lunch with a good friend, and a bit later, I actually found the Martha Stewart Edge Punch set I've been looking for at Wal-Mart! Thanks oodles, Shirley for the heads up!!! They had the Loops, Scallops, and Spider Web sets - $20 for both punches! I got the loops - felt they'd be more versatile. If you have been searching, you might want to try Wal-Mart. FYI: At our particular store, these were not with the other M.S. Punches - they were down the sewing row near the Cropodiles. Hope you have had a good day! Thanks for stopping by - See you soon! ~My idea of housework is to sweep the room with a glance! Stampin' Sisters in Christ has become very close to my heart. I look forward to going to their site each day for the encouragement and kindness that I know await me there! These ladies always have a positive outlook, and spending a bit of time with them each day helps me to stay focused and positive as well! The following have always been some of my favorite Bible verses, and I feel like they perfectly describe the way these gals go about their days! Thanks ladies! Be at peace among yourselves. . . Always seek to do good to one another. . .
For this is God's will in Christ Jesus for you." This card was created for the Stampin' Sisters in Christ Challenge this week. We were to include "Thinking of You", or "Praying for You" on our cards. I believe I fulfilled both sentiments! Oops, in looking at the photo, I just realized that I accidentally pushed the ribbon over the word 'prayers' when taking the picture..... However, I have the smartest audience in the world, so I'm sure that you had already figured that out! I am also submitting this to Paperlicious Designs. Melisa's latest challenge was to use vellum on our projects. I had a piece of flowered vellum in my stash, so I used it for the background. The sentiment on the left is adhered on the card flat, I used semi-dimensional dots on the Thinking of You sentiment, and used a large dimensional dot on each of the blooms of the flower. Melisa is another creative mentor that has such a kind and generous character. I go to her blog daily as well, for both emotional and creative inspiration, and am never disappointed! Recipe: TAC Stamps, DCWV CS, Vellum and Ribbon from scrap stash, flat pearls from Kaiser. Thanks for stopping by today! Hope you like this card. Didn't mean to 'preach' today, I just felt the need to let these folks know how appreciated they are! Have a great night, and I will see you all tomorrow! I'm off now to check YOUR blogs for inspiration! So...how is everyone? Ready for a new week? It's supposed to be cool and windy here this week, not sure I'm ready for that! DH has a doc appt. Monday in the city. I hate it when that happens, as it means I am forced to endure a trip to Hobby Lobby, Michael's, and etc... Just kidding - I look forward to our scarce days together and our little shopping excursions. 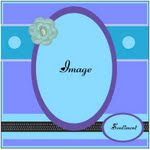 Both projects today feature a free digi image that I grabbed at Digital Delights Freebie Friday. Isn't this just the cutest little ghostie? The sketch is from the Delightful Sketches challenge. The challenge at Stamptacular Sunday Challenge was "Tag, You're It", we were to use a tag on our projects. I needed to box up a couple of cookies for a friend, so I made a 3 x 3 Pizza Box instead of a card. You can see my tag dangling from the spider! This photo shows the bow at the top of the box, and shows how I stamped the ghost image a second time and cut out all of the ghost pieces and pieced them over the image with dimensional dots, making the ghostie a bit 3D. Yummm...these are some of the cookies that DD baked for the fall festival. They are whole grain cookies and are very tasty, and as you can see, they are 3" in diameter! I'm off to the city today for some fun with DH, so be safe, have some fun in your craft rooms, and I'll see you later! Today was the annual Farmington Fall Festival. A couple of city blocks are closed to traffic each year for the Fall Festival. Businesses hold sidewalk sales, and crafters are invited to set up tables for a fee, and their items. DD is working to get into freelance photography, and set up a table with her black and white cards and framed prints, AND with her whole grain chocolate chunk cookies. MMMmmmm...... She asked me to go along and help her take care of business. Well..... "business" was SO much fun! It ended up for me, being mostly a visit with friends! If you can believe it, I am very sunburned! Anyway, basically, business was the usual craft sale - most folks just wandering around, enjoying the day, but some were buying. She sold enough to be able to go into St. Louis tonight for a girl's night out, and has potential comissioning of several large orders for a few folks. She had her camera with her, and was asked to shoot some 'on the spot' photo's of one woman's granddaughter, as well. I have a few things to show you today. These were all done yesterday, and I hope that I haven't missed any deadlines. I couldn't get them posted yesterday, and was busy all day today! Anyway, here goes! This first card is an adorable image by Sweet 'n Sassy Stamps. It was a free digital image that I grabbed (yup Cat, another one! ), and I used the S&S Sketch to create this card. The sketch had a spin...we had to use any shade of red, black, and tan. So, I jumped into my 'stash' of scraps, and found enough of all three colors to get this card made! I think this image is adorable, and I like the way the card turned out! Recipe: Lots of scrap papers, a scrap of ribbon, Nesties, Stampin' Up Wild Wasabi and Bashful Blue, Kooh-I-Noor Colored Pencils, and Black Tombow Marker. 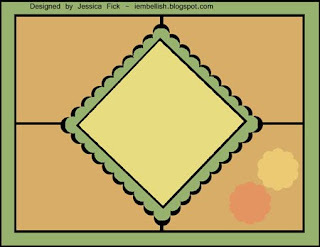 Recipe: Stampin' Up Bermuda Bay CS, Ribbon, and Ink, Misc. DP and lace from stash. Last, I have another fabulous sketch from Cindy Hafner. 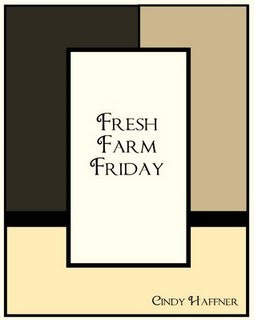 This sketch was the challenge at Farm Fresh Friday. For this card, I chose to use some DP's by Best Creation, and the Snow Anya from the Rain, Snow, Shine set. A dear friend (you know who you are!) sent me this set as a gift, and I just love inking up these darling images! The black CS at the bottom of the card is two sided, and the cut out pieces around Anya are cut out of the front side of the card. The black that Anya is mounted on is actually a printed CS with the circles and stars on it. I just cut out some MORE circles and stars, and popped them up on the DP. They are all glittered! Anya was colored with my colored pencils also. Recipe: DP by Best Creations, Anya Stamp from The Greeting Farm, White Fun Flock, Fabric trim by We R Memory Keepers. Yesterday, while reading a daily post at Kimberley's Kard Kreations, I noticed that she has a Thought for the Day. I couldn't help but 'borrow' it for today's card! (Kimberley has an adorable blog - be sure to drop in and say hi!) I'll tell you what it was in a minute or two!!! First.... every Monday morning, Nina posts a free digital image at There's Magic in the Air. What makes these extraordinarily special, is that Nina designs and illustrates these herself. Very talented lady!!! This week's free image was Eldon. Now Eldon is just absolutely the CA-utest worm that I think I've ever seen! When I saw Eldon, I knew that I had to find time to work something up using this adorable image. 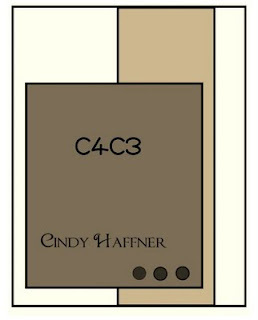 Then when I saw Cindy Hafner's fabulous sketch (above) at Crazy4Challenges, I knew exactly what I was going to create with Eldon! See what I mean? How could a girl that is about to post the CA-utest worm she's ever seen NOT use that little poem? Lol...perfect for this lil' Eldon, isn't it? Recipe: Image from There's Magic in the Air, DCWV CS and DP. Nestie, Kooh-I-Noor Colored Pencils and Low Odor Mineral Spirits, Ribbon brads by Karen Foster, Tombow Markers, Stampin' Up Bashful Blue, Stampin' Up Wild Wasabi, Starburst Gel Pen. This next card also features some artwork by one of our own bloggers! Stef, aka, Glitterbabe, drew this gorgeous daffodil! She offered it up free yesterday, and I couldn't resist. I snagged it, and created this card with it. Stef - you go girl!!! Head over and check out Stef's blog - I guarantee you will laugh out loud today!!! I used this sketch, from Inky's Delight, and added some butterflies for Flutterby Wednesday. I think it turned out very soft and pretty, but as is the case sometimes, the photo doesn't do it the justice that real life does! You can't tell in the photo, but the DP (by Provo) is Glitter paper (in honor of Glitterbabe, of course!). Colored again with KIN/LOMS. Hope your day is fantastic! ~Only in America do we leave cars worth thousands of dollars in the driveway, and park all of our useless junk in the garage!!! Michelle, this one's for you! This week is "Buttons" at A Little Whimsy, and yesterday was "Tuesday Triplets" day at 365 Cards. Whatever we did, was to be done in triplicate, except the sentiment. So, here are three panels of DCWV DP, topped off with PaperTrey Ink's cute little hot air balloons (BUTTONS!!!) (THREE!!!). Funny how things work out. I made this one in a hurry, and thought it would be one of my least faves ever, and it turned out pretty darned cute, I think! I kind of like it! Recipe: DCWV Winter Mat Stack (last year's), Versafine Black Ink, Stampin' Up Bashful Blue Ink, PaperTrey Ink "Everyday Button Bits", buttons from my stash. Next is a fall card that I made for the Stampin' Sister's in Christ Challenge (to use fall colors), and for the My Time to Craft Challenge (Autumn), and last but not least, for the 365 Cards challenge for Monday, which was to make a card that was inspired by the following colors. Recipe: TAC "I'm nuts about you", Provo DP, Ribbon from Hobby Lobby, DCWV CS, Kooh-I-Noor Colored Pencils, Versafine Brown Ink. Yesterday, as I posted the candy on my sidebar, I was reminded just how short life can be, how everything can change in a split second, and that I don't tell you all enough just how thankful I am to have met so many wonderful friends through this love of paper that we share. Thanks to all of you for your thoughtful and caring comments, and for sharing your talents with me! So...I'm sure you all thought I had disappeared! I really didn't, just had tons of business to take care of! I'm back, and ready to work on some items. Before I post my silly little things, please be sure to check out the top order of business on my sidebar. This blog candy is not 'just your ordinary' candy. This is candy for a very special cause. Today's project is a little something that started as just the candy treat. DD is having a booth on Saturday at Farmington's Fall Festival to try to sell some of her wonderful photo cards. I was working on some little colorful treats to put out in a "free with purchase" box. I finished the little candy treat, and thought, golly, that would make a cute tag too! So I played around with a tag. Of course, one thing led to another, and I then freehanded the large monster on the brown bag. Bag, Tag, and Candy Treat! All in all, it turned out kind of cute. It will be something to offer on Saturday if someone buys several cards from DD! Stamptacular Sunday (anything but a card). Hope you like it - Thanks for stopping by! Had some Blogger issues today and lost some of the blogs that I've been following forever! If I have been following you, and you don't see me anymore, would you please let me know? A friend asked me to re-post this little 'billfold'. So, dear friend (you know who you are! ), here is my instant replay! This is a free pattern in the back of the Angel Company's Serendipity catalog. It was fun to put together! My BF Shirley gave me all of the pieces in 'kit' form in my birthday bag earlier this year. (you need to hurry and get on Shirley's birthday list - her gifts rock!). Anyway, I'm uploading this to the SophistiCat Challenge today! You need to drop by and check them out. They are a new challenge site, and it looks like it could be a LOT of fun!!! Hope you have all had a safe and very blessed weekend. Ours has actually been fairly quiet! YAY for quiet weekends! "So Grateful" is the name of a beautiful stamp set, created for Gina K. Designs, by the most talented Rupa Shevde. This is a wonderful fall set. It contains acorns, a wagon full of apples, pumpkins, a cornucopia, several sentiments, etc., 12 images in all! What is extraordinarily special about this set, is that when Rupa designed it, a portion of the proceeds were donated to Feed the Children, which is an organization that provides food and water, and hope to children all over the world. Gina K. is a very generous and kind woman, and you will find her very often with a 'cause' to donate toward. This week, Gina is the Guest Designer and sponsor at the Stampin' Sisters in Christ Challenge. 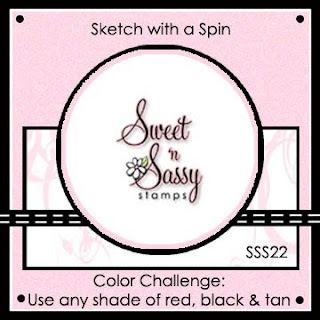 Gina provided this week's sketch, and is offering up two wonderful stamp sets as the challenge prize. One is the set that I've named above, and created my card with. The other set is the Autumn Beauty set, by Theresa Momber. I don't yet have this set, but it is certainly on my wish list! Theresa is one amazing lady. She includes a tutorial with nearly every card she features on her blog, and is a wealth of knowledge! She, like Gina, is kind, and helpful, and generous, a beautiful lady inside and out! Okay, enough already! I didn't mean to preach! I am just in awe of beautiful talented women that can still be kind and thoughtful! Know what I mean??? Since I began this blog, I have been blessed with 'meeting' so many new friends! You all know who you are! My card today, as you probably have figured out is made with the So Grateful set. The sketch, shown below, is what I followed. In place of a ribbon on the middle of the card, I used the acorn border in the stamp set. It worked out perfectly! I moved the brads to the left corner, as I wanted to put another acorn on the little corner at the bottom, and felt it needed balancing! Other than that, I did not flip or rotate anything!!! Aren't you proud of me??? Hope you like something about it! I love the images. They are all colored with Kooh-I-Noor colored pencils and LO mineral spirits. The Brown CS is DCWV, and the patterned DP is on the Gina K. Stamp TV site, in the Freebies!!! You can download it free! This is from the floral frenzy patterns. Have a great Friday - I'm off to climb back up on my ladder and put coat number 2 on wall number 1. Enough of that UGLY pinhead staring at me when I open my blog - lol... I have the sweetest little face to replace him with! Before I show you my card, I have an update on the non-profit auction I made gifts for. It was held tonight. My items (except for the mugs) were all put into one gift basket and raffled as a set. IT WENT FOR $110.00!!!!! And if that's not enough, our one little tray of homemade Pecan Bars went for $85.00!!! Wowzers!!! I am certainly in shock! People are certainly good, and rise to the occasion when needed!!! Hope this one doesn't scare you as bad as the last one! The gorgeous ribbon is Stampin' Up, by the way! Today I painted a wall in the living room. Of course, this meant not much room in my girl cave! I snuck in for a bit this afternoon and made a really quick card for Barb Foster's Macabre Monday Challenge. This week's challenge was to choose a horror flick for a little inspiration. Barb's sample card was "Carrie", and it is awesome. You really should run over and take a look at it! The two scariest movies I think I've seen are The Exorcist, and The Shining. Both still to this day scare me, so I couldn't make anything using them! Of course, to be honest, the last few days, the scariest flicks have been watching my beloved Cardinal's lose their ball games!!! I chose an old creepy tale that I saw several years ago, called "The Hellraiser". I found this picture on the internet, and just couldn't resist the straight pins! Of course, the only one I'd be brave enough to mail it to would be Barb!!! Lol... Anyway, here's to 10 minute cards!!! Supplies: Black CS, Internet Photo, Sentiment: River City Rubber Works, White Embossing Powder, Embossing Ink, Pop dots. I think I need to go make something a little less gruesome now! Gilda Radner once said, "Life is about not knowing, having to change, taking the moment and making the best of it, without knowing what's going to happen next. Fund Raising Auction Items... Finished! I didn't get started on any of this until almost 4 p.m. today! I just do not have a clue where the hours in my days go! There's an 'hour goblin' out there someplace, just gobblin' up my days! Above, is a fall colored coffee mug, filled with Cocoa Mix, a couple of flavored teas, and some Milano cookies - Yummy! I totally forgot to take pictures prior to plastic bagging these, so the photo's aren't all that great. I just used some cute Halloween/Fall DP, and embellished a bit with ribbon and pop dots. I think the candy bars are pretty much self-explanatory! Mmmm.....Chocolate! Below are some boxes I made and filled with wrapped Nuggets. Two of the boxes hold a dozen nuggets. The tiny box is only 1/2 deep (how cute is that!) and holds only 9 nuggets. Okay peeps.... that's all I have tonight, and I am so tired! My Redbirds fell to the Marlins 2-1 tonight, and I'm bummed.... sigh.... Thank goodness tomorrow is another ball game! Hugs to all, especially to those who dropped in on my DD today and took a quick peek at her blog! You are so sweet! When something is taken from your grasp, God is not punishing you. He's merely opening your hands to receive something better. Concentrate on this - "the will of God will never take you where the Grace of God will not protect you".